i've mentioned before that i teach college courses at a local university. last week i had to keep my grad students late after class since we had a ton of presentations to get through in our very large over-enrolled class. i felt bad for them for having to stay so late, so i baked a batch of classic chocolate chip cookies and took them into class for my students. they went wild over the cookies, and absolutely loved them. one of my undergrad classes happened to hear that i baked cookies for my grad class, and they were jealous. so, to keep the peace, i baked a batch of cookies and took them into class for my undergrad students. 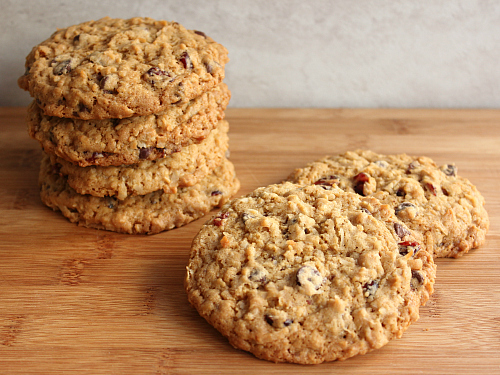 instead of making chocolate chip cookies again, i made oatmeal cookies with coconut, dried cranberries, and dark chocolate chips. oh my goodness, these cookies were so incredibly good! ryan came home as the cookies were cooling on the kitchen counter and of course he had to dive right into them. 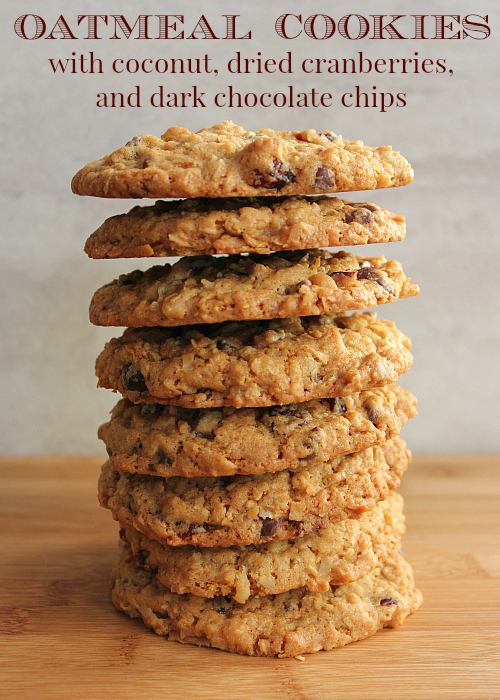 the combination of the oats, coconut, dried cranberries, and chocolate chips was awesome! preheat your oven to 325 degrees F. in the bowl of an electric mixer, cream the butter and sugars together until combined. add the egg and egg yolk and beat well. mix in the vanilla. in a separate bow, sift together the flour, baking powder, and baking soda. add half of the sifted flour mixture to the batter and beat just until combined. add the remaining flour mixture and beat. mix in the oats and the coconut. 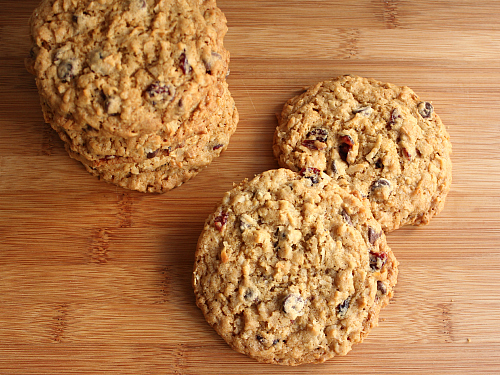 fold in the dried cranberries and chocolate chips. line a baking sheet with parchment paper and scoop 3 tablespoon-sized balls of dough onto the cookie sheet for large cookies (be sure to space apart the cookie dough balls since they will spread as they bake.) bake for 20-22 minutes until golden brown. once baked, allow the cookies to cool on the baking sheet for 5-10 minutes before transferring them to a wire rack to finish cooling. These sound absolutely delicious! I will have to make these! I am so glad that I got to try one of those cookies. They were so good and not sweet at all. This recipe is a winner.